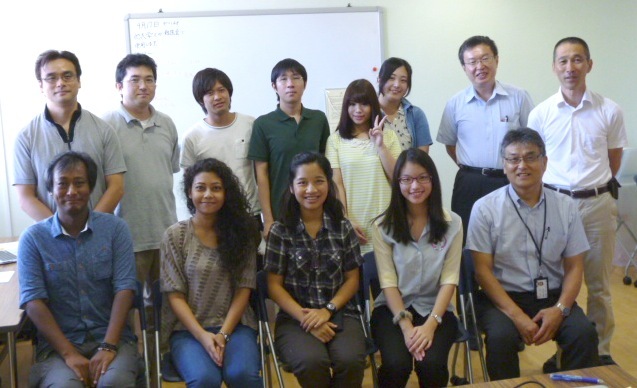 Nagasaki University’s International Environmental Experts Internship Program has just started from 21st August 2013. Three students from Mahidol University, Thailand (2 undergraduate students from Mahidol University International College and 1 graduate student from Mahidol University) are staying as an intern at the Faculty of Environmental Studies, Nagasaki University during the Program. Opening ceremony for the Program was held at Faculty of Environmental Studies, Nagasaki University on 22nd August, 2013. The Welcome and Opening remarks were made by Prof. Akihiro Taimura, Dean of the Faculty of Environmental Studies, Nagasaki University. Ms. Jyoti Joshi from Nepal, who is 2nd year Master’s Degree student of the Faculty of Science, Mahidol University, Thailand, joins our laboratory as an intern for a month under the Program. She will learn skills for molecular biology during the Program. Moreover, she will introduce her Master’s Degree studies related in shrimp biotechnology to our laboratory’s members as a special seminar on 30th August, 2013.